After I installed my 2.25 budget boost I noticed driveline vibrations. So I wanted to lower my transfer case. When I tried removing the 6 bolts holding the skid plate up, only one came out. The other 5 loosened slightly and spun without lowering. When I attempted to tighten them up they kept spinning. To remove the 5 spinning bolts I needed a 2 foot pry bar and an impact wrench. I put a floor jack under the skid plate, leaving an inch gap between the jack and the skid plate. 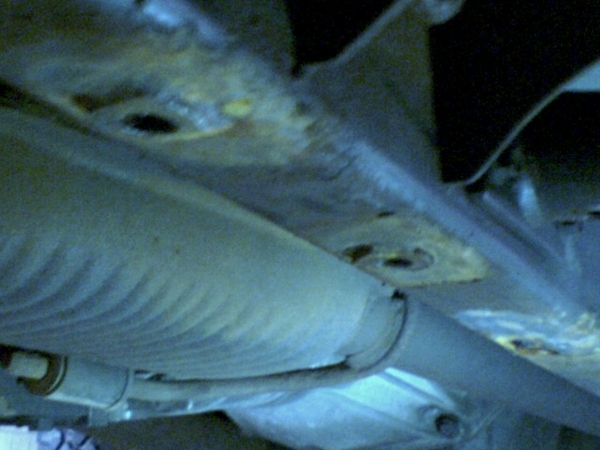 Working from one side at a time, I inserted the pry bar between the frame rail and the skid plate. 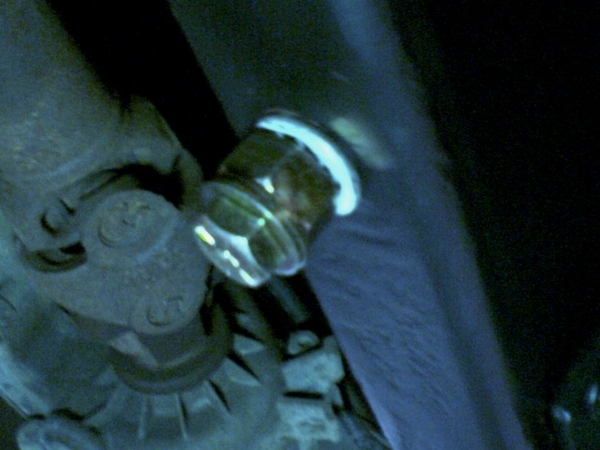 As I asserted downward pressure I was able to loosen the bolts. Each bolt would loosen about 1/16 to 1/8 of an inch at a time. I would move from one bolt to the next until I had the 3 on each side removed. Once both sides where removed, I jacked the skid plate back into position and supported the transmission with a floor jack. From there I removed the 4 nuts holding the transmission mount and removed the skid. Here is what the frame rail with the old nutserts looks like. On my 97 they are tack welded at the front and rear of each nutsert. To remove the old nutserts I used a grinder, a drill with a 9/16 drill bit and an air chisel. The hole in the frame rail is 5/8. I did not want to make the hole any bigger. I used a 9/16 bit and drilled through the existing hole. From there I used a grinder to remove the tack welds. Once they were removed I used an air chisel to pop out the nutsert. This was a little overkill. I probable could have used a hammer and a screwdriver. Once the old nutserts where removed, the holes in the frame were untouched. I used a grinder with an 80 grit sanding wheel to grind the rust off of the frame rail. It’s a good idea to prime and paint the frame now. To install the new nutserts I used the tool pictured below. Thanks to Mrblaine who took the time to call me on the phone and explain how to make the tool. You can use a 5/8 nut instead of the drilled out 9/16 nut, I used the drilled out 9/16 because it fit better over the star lock washer. 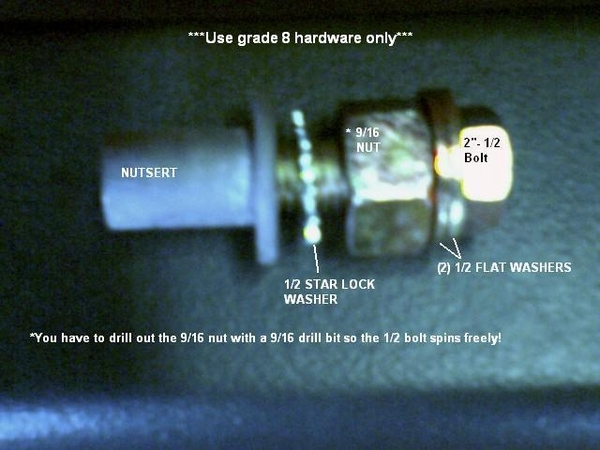 I felt the drilled out 9/16 nut gave the star washer more bite than with the 5/8 nut. The nut and the star lock washer prevent the nutsert from spinning. You hold the wrench steady and tighten the bolt. The wrench and nut stay stationary. 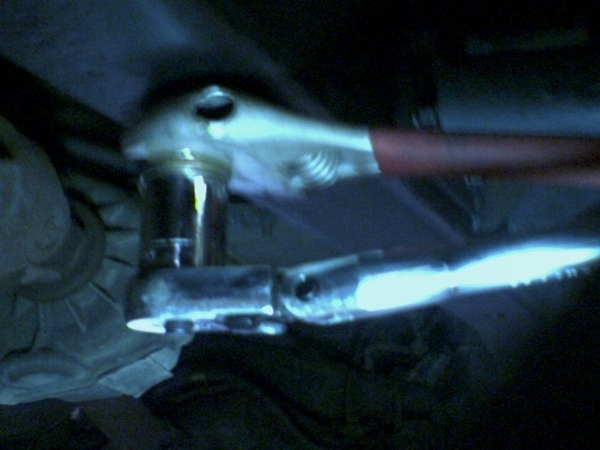 As you tighten the bolt it creates force on the nut and the lock washer. That force allows the lock washer to dig into the nutsert, holding it stationary. By holding the nut steady it holds the nutsert steady. The nut, lock washer and nutsert act as one moving part and the bolt is the other. The two upper washers work sort of like a bearing between the two seperate parts of the tool. If you have a welder I would recommend tack welding the nutserts in place. ( I did this after I installed them) If you don’t I would recommend putting red loctite around the outside of the nutsert sleeve where it will meet the frame when you insert it into the hole. Once the loctite dries it will help to keep the nutsert from spinning in the future. Once you insert the tool and nutsert into the frame, its time for a little work out. My arms were screaming by the time I had the fourth one installed. There have been issues getting the OEM nutserts. You can get a quality replacement set of Nutserts and Bolts from Mr. Blaine. Quality Kit at about half of the price of the OEM . P.S. You can read this entire thread, but all the information you need is in this post. If you think that putting a bolt through your frame is a good idea, you are wrong! If you think you can find a cheaper nutsert from anyone else other than the dealer that is as good as OEM, you are wrong! Do it right and do it once! xxdabroxx and Rob80x like this. Last edited by BDuece; 05-15-2010 at 12:07 PM. This is going to help a lot of folks. Thanks for taking the time to do the write-up, and thanks to mrblaine for helping too. This should be added to the FAQ. May I ask where you can purchase said "Nutserts?" Your local jeep dealer! They cost $7.50 a piece! six nutserts and six bolts were $74. Last edited by BDuece; 10-05-2009 at 07:57 AM. Engine: 4.0 Liter (242 CID) 6 Cylinder. Transmission: 42RLE - 4 Speed Auto with O/D. Transfer Case: NV231 with AA SYE and CV Drive Shaft. Front Axle: D30-AlloyUSA 30 Spline CrMo shafts, ARB, CTM's, Vanco 16" brakes, Savvy Black Magic pads. Rear Axle: D44-AlloyUSA 30 Spline CrMo shafts, ARB, factory disc brakes, EBC Greenstuff pads. Axle Gear Ratio: Superior 4.88's. Suspension: RE 5.5 LA w/TriLink, Rancho 9-Ways, Poly Rr Outboard Kit, Currie 1" BL&MML, 1-3/4" frt spacers. Tires: 35" Goodyear MT/R's w/Kevlar. Wheels: 15x10" AR Outlaw II's. Recovery: T-Max EWI-12000 Wireless Remote Winch, Warn 30'x3" Recovery Strap. Armor: Savvy Tank Skid, LOD Ft Comp Stinger & Rr Xtreme Bumpers, Currie RockRibz, Rockcrusher Diff Covers. Accessories: Currie Anti-Rock & HD Steering, Warn 7" Flares, sPOD & The Source, "Factory" XM Radio. This is rather hard to explain unless you've done it. I can vouch for the late models and the 12mm. The late models are not welded either! Outstanding write up!!! Thanks!!! Could you go into a little more detail on what u need for the tool and such. i think i might have to replace mine so i would like to know what to do if mine spins. 1997 Jeep Wrangler SE 2.5l 4 cylinder auto, Stock. McMaster-Carr carries nut inserts in many sizes/materials. They're cheaper than the jeep dealer (imagine that!). From the main page, look under 'Fastening and Sealing' for 'Rivet Nuts'. I do have a question, though...were the inserts you got from Jeep steel? Did it require an ungodly amount of force to install them? I was thinking about getting some 3/8" steel nut inserts, but I wondered if I could realistically install them with hand tools. 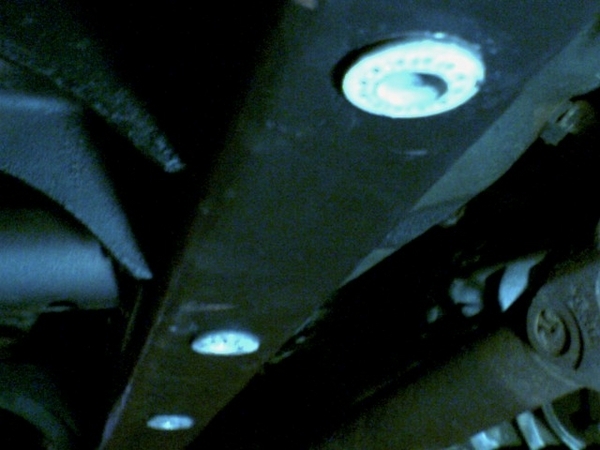 For removing the skid, If only one is spinning, you might not need a impact wrench, but it makes it easier, a pry bar or flat bar and a BFH ( actually a rubber mallet will do). Removing the old nutsert, Drill with a 9/16 bit, and a grinder with a cut off wheel. If you don't have a grinder with a cut off wheel, you don't know what your missing. You can get a cheap one for $30 at home depot. I have a 4 1/2 grinder that I paid $30 for and I use it all the time. If you don't have a 9/16 drill bit I would get one. If you try to grind out the hole with something else, just realize that $8 for a single drill bit isn't that expensive once you realize that you rounded out the frame holes and the nutsert won't bite. Yes they where steel inserts. I started with a 3/8 drive ratchet and ended up using my 1/2 drive torque wrench. By the time I had the 4th one installed my arms were screaming. I had the torgue wrench set at 80lbs and it crushed the insert. I checked Fastenal and McCaster, the largest I could find was 3/8. Last edited by BDuece; 03-20-2007 at 05:15 PM. If you have one that spins, you might be able to get the bolt out and use Mrblaine tool to reset the spinning nutsert. Last edited by BDuece; 10-05-2009 at 08:00 AM. i dont really understand how the nutsert works and how u keep it from spinning when the new one is installed...i also dont understand how the new one is installed..i got myself all confused. The nutsert is like a rivet. It is deformed and crushed against the inside of the frame. From looking at the tool (bolt, nut, washers, star washer) I would guess that the star washer is what keeps the nutsert from turning before it's crushed.